I’m a public servant by day, and an obsessed amateur genealogist by night. I’ve been researching my family history for a few years now and have identified all of my 3rd great grandparents. 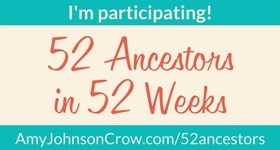 I did my first DNA test almost 3 years ago, which sent me down the rabbit hole of genetic genealogy from which I’ve yet to emerge. I’ve been a WikiTree member since 2014. I was recently featured on the WikiTree Blog’s “Meet our Members“. As well, I participated in a WikiTree LiveCast, where I gave an Intro to WikiTree presentation.